Here’s another marine illustration – a Clown Triggerfish, commonly seen in saltwater aquariums (and of course tropical coral reefs). Triggerfish have nasty teeth and strong jaws for crushing sea urchins. They can also be quite aggressive to other fish in aquariums. This one is friendly though, he just wants to hang out with his buddy the Lionfish under the sea… uh oh… now I have that darned Disney song going around in my head. 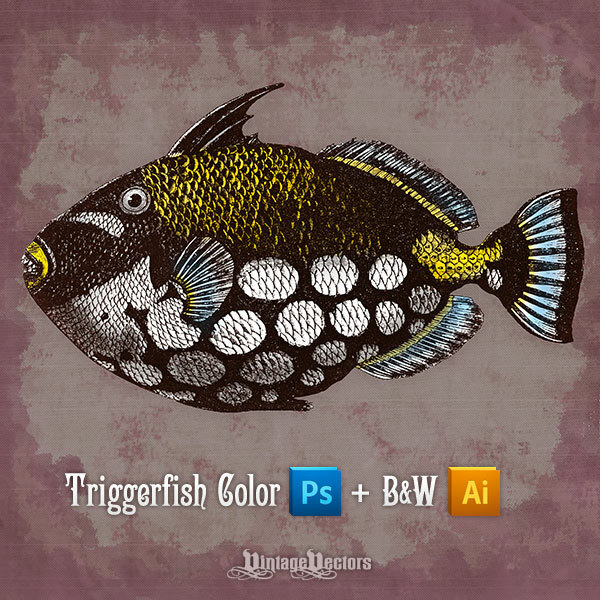 This Clown Triggerfish illustration download includes a b&w vector and a hand-colored high resolution PSD with transparent background for drag and drop convenience. Wow! That turned out nice! Both fishes did! Thank you! Thanks Su. Hope you are well too!